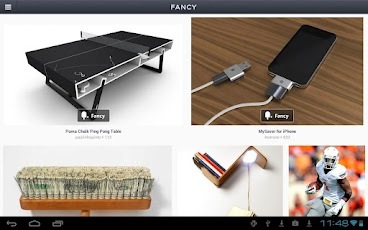 Since launching its commerce platform in February, Fancy has gone on to double its user base to 500,000. A lot of signups is all good and well, but what really counts is how often engaged those users are. While Fancy itself wants to veer away from the Pinterest comparison, it’s hard to avoid. We already know that Fancy users are generating far more content than their Pinterest counterparts. Last month, we reported that Fancy’s then 250,000 users had generated 22 times more content than Pinterest’s 11 million. That high level of engagement certainly hasn’t slowed down. In just 24 hours, Fancy users generated 500,000 which evens out to about 6 items ‘fancied’ per second. Want a few more statistics? Fancy is more than happy to oblige. The site is driving social commerce traffic to over 1,000 merchants, including designers names like Alexander McQueen, Gucci and Yves Saint Laurent. Fancy has also offered over 500,000 deals to its users. That’s not the only piece of news that Fancy is announcing today. To cater to its rapidly growing user base, the site is launching an Android app, for smartphones and tablets. Having launched an iPhone app long before it launched its e-commerce platform, Android users can now enjoy the site on the go using their smartphones. Fancy has been at the forefront of innovation, turning the traditional e-commerce platform on its head. Merchants can take advantage of a reverse Groupon model – if a large group of users express interest in a product, the merchant can offer a group discount. We already know that 21% of Pinterest users who found items on Pinterest have gone on to buy them, and Fancy is filling that gap. Its users have made purchases ranging from as little as $5 for a salt shaker, to $10,000 for a watch. Fancy’s innovative approach puts as much power in the seller’s hands as in the buyer’s. Fancy users can generate demand for a product and enjoy a discounted price as a result, if the seller chooses. At the same time, sellers can take advantage of a fully functional e-commerce platform, giving them all the essential features from managing inventory to calculating shipping and printing labels, while being the first to enjoy a completely socially driven marketplace. The site’s marketplace isn’t limited to physical items, but can be used for just about anything from hotel reservations and event tickets, to books, clothes and more. Fancy’s investors include Twitter’s Jack Dorsey, Facebook’s Chris Hughes, Maynard Webb, the former COO of eBay, and Bob Pittman, the creator of MTV.